Patients determine whether they like their healthcare provider and will visit them again based on more than just expertise. Bedside manner, the provider’s ability to create a positive rapport with the patient and deliver information in a way that is easy to understand, is as important, if not more, than medical skill. If you don’t know the patient well, be sure to introduce yourself. Clearly state the purpose of the visit and explain what you expect to happen during the session. Be sure to ask the patient if they have any questions or concerns about the fact that the visit is being conducted remotely. Ok, you can’t actually make eye contact because you aren’t in the same room, but you should look at the camera and position it so that it appears to the patient that you are looking right at them. This takes a bit of practice, so you might want to try some practice sessions with members of your staff who can give you feedback. Patients only get a few minutes with their provider and you want them to know that they have your full attention during the visit. Make sure that ringing phones, staff members, or anything else doesn’t interrupt your encounter. Also keep the background of the shot in mind. Try to make sure it is a simple wall or decoration, nothing too cluttered or bright. You may be sitting down during a video visit, but good web-side manner dictates that you should not slouch or lean off to one side. Sitting up straight shows the patient that you are engaged in the visit and that it is just as professional as an in-person encounter. Be sure that you schedule enough time to wrap up each visit by answering the patient’s questions, restating the treatment plan, and outlining next steps. If you run out of time and end the session abruptly, it will feel to the patient like you’ve hung up on them. Perhaps one of the most important things you can do is ask for feedback. Your patients are the best judge as to whether your in-person people skills are coming across as well as they could online. 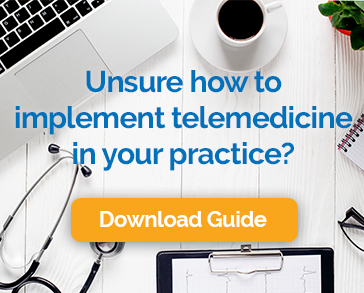 By developing a good web-side manner, you can leverage telemedicine to build your practice and your relationships with patients.